Content Warning: This post contains an obnoxious meme and implied/light profanity. Reader beware. During a particularly slow shift at Paper and Clay last fall, I spent a substantial amount of time looking through our miscellaneous art supplies. While combing through plastic bins of charcoal, watercolors, and pipe cleaners, I found one box filled with rubber stamps, a clear embossing ink, and a plastic bag filled with embossing powders of all sorts. Intrigued, I began trying all of our different and interesting stamps in conjunction with the embossing powder, and I was surprised and delighted at the quality of the stamps. I was so enamored with this one, for instance, that I have been carrying it around in my design journal ever since. Later, inspired by the elegant and beautiful lines that embossing powder could make, I began to search for more information about the product. Can I use embossing powder on wood? Glass? Does it look better on smooth or rough surfaces? No matter how long I looked, I couldn’t find any of this information. It seemed that embossing powder had been relegated to the craft world, with the corresponding lack of data that can be expected from the stereotypical scrapbooker. But why should that be? I took matters into my own hands, designing a few simple tests to catalogue the qualities of embossing powder, and embarking on Mission: Embossable. Embossing is the process of raising an image on a thin, flat medium to create a 3D shape. In industry, it is common to emboss sheet metal (with hot dies), card stock (with high pressure and dies), and leather (with stamps or brands). Generally, embossing is done on things that have a high rate of production – it’s not cost effective to manufacture a die for a run of 20 Hallmark Cards. But what of the common man? Shouldn’t everyone have the right to put beautiful flourishes on paper craft without running down to the production-line-quality die store? Naturally. What if the common man needs to put Dickbutt on everything he owns? Before you apply heat, the enamel chunks pack into the surface you are trying to embellish. 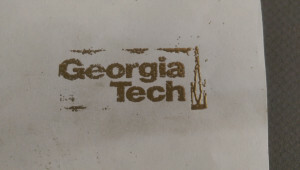 In preparation for my tests, I used the Invention Studio’s laser cutters to cut out some stamps on a piece of linoleum from Blick. I made stamps ranging from low to high intricacy, with varying ratios of negative and positive space. The stamps also varied in levels of emotional maturity, although I’m not sure that impacted the validity of the tests. In trying to run the gamut on possibilities for this test, I put my embossing powder through its paces. I applied clear ink from an “Embossing Stamp Pad” and Zing! Embossing Powder in gold with a metallic finish to several materials using my custom stamps. Among the materials that I tried were glass, acrylic, steel, leather, paper, and wood. To make a long story marginally less long I summarized the effects in a series of pictures in the following gallery. Inking on the acrylic was difficult, as it was easy to accidentally smear. High potential to smear means that I had some weakly defined edges. …which translated into this gross mess on acrylic. 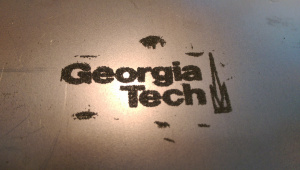 However, acrylic looked awesome on the opposite side of the embossing. Seems like something with potential later. Frosted glass had a high retention of embossing powder, and a nice, even coverage. The powder adhesion didn’t guarantee a nice embossing. …but the finish quality and the contrast were both weak. Before melting, the powder held a striking contrast against stainless steel, particularly under direct light. I really loved the clean edges and smooth coverage on the stainless steel. Because of the incredibly slow melt time on metal, it was easy to make sure that fine lines of powder didn’t become an indistinguishable mess. Despite a solid ink print, very little of the embossing powder stuck to the leather. Nothing about using embossing powder on leather was pleasant or satisfying. 1/10 would not recommend. Walnut contrasted nicely against the gold powder, and its tight grain structure kept the strong vertical lines of this stamp distinct. Rough-toothed charcoal paper provided excellent contrast, but did not allow for full coverage. Regular printer paper had a lackluster performance. 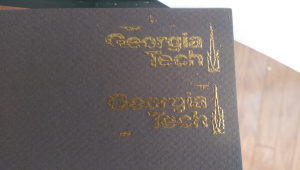 The embossing looks much better in high contrast – darker materials make the stamp really pop. Leather does not take to embossing powder at all, which is really, really disappointing. Moreover, the ink will actually permanently stain leather where the powder did not stick. Embossing powder will stain any lighter surface – white paper will easily and permanently become brown tinged paper. Embossing powder takes an exceptionally long time to melt and reform on stainless steel, and, if you aren’t careful, you might burn yourself. If embossing on wood, grain orientation will affect the quality of your print. If your stamp is comprised of mostly vertical lines, take care to align those parallel to the wood grain. You’ll thank me later. Unsatisfied with my cursory exploration of embossing powder’s capabilities, I devised a basic test to examine the relationship of embossing quality to surface finish. The test consisted of sanding a sacrificial piece of oak board and covering different sections of the board with random finishing substances from my garage. Truly, the most scientific and precise setup known to man. As I progressed through this test, several things became evident. Sticky (or permanently wet feeling) surfaces will stick to embossing powder indiscriminately. (Thanks, mineral oil.) Crisp edging is more likely to occur on surfaces which release excess embossing powder easily. Finishing products have less of an impact on stamp quality than surface smoothness; the 400 grit preparation created the best looking stamps. Regardless of the finish quality of the wood, it is beneficial to protect your stamp with an additional layer of protective finish. Embossing powder can be susceptible to chipping, and it wears away with significant surface handling. Embossing powder is non-toxic, so your only side effects will be disappointment and looking fabulous. Does my surface feel permanently wet or sticky? Is it rough? Will it be exposed to daily wear and tear, like rubbing or chipping? Is my surface so smooth that it is slippery? Does my surface melt at low temperatures? If the answers to any of those questions are affirmative, you should probably hold off on using embossing powder. Otherwise, make yourself some stamps, and have a great time!